When you’re looking into buying a BBQ smoker, things can be as simple or as complicated as you make them. We bet you (just like us) like to keep things simple, but there are so many styles to choose from that things might feel complicated anyway. That’s when I decided to break down what I needed in a BBQ smoker and would be a deal breaker if I couldn’t find one with said feature. And then I determined which features I could be a bit more lenient with or that I could adjust later on. That’s how this guide on what BBQ smoker to buy was born. Whether you need a smoker that will only be used for large meat cuts or one that is versatile and will let you make smaller food items as well, you’ve come to the right place. After my analysis, I ended up getting the Weber Smokey Mountain 18 Inch Smoker since it’s simply the most trustworthy BBQ smoker out there. It has existed for a while now but continues to improve by listening to its users and adding new, useful features that continue to make it number 1 in my books. Trustworthy brand, continuous support and improvement. Nice set of features that make it stand out. It’s almost crazy to even think about changing a reliable and popular smoker such as Weber’s Smokey Mountain Smoker, especially since Weber has taken the time to listen to us (the customers) and make the slight changes requested to this unit. They added a lid mounted thermometer, as well as a bottom mounted heat shield which is unobtrusive to the unit’s functions but is very convenient for you. Before this change, you’d have to drill a hole and place your own thermometer or keep one next to the smoker and regularly open the lid to check on the temperature. With this new change, you can easily monitor the cooking temperature and the heat shield protects whatever surface you decide to place your BBQ smoker on. Overall, we got a highly improved WSM. Classic design that can be both a BBQ smoker and a grill. Best feature set for its price, since it’s very affordable. The Char-Griller is another timeless classic, but this time in the form of an offset firebox smoker. There’s a reason this design is so popular: it simply works. This BBQ smoker is extremely easy to use and you can even get a rotisserie attachment kit to go with it. Just like its siblings in the same smoker type, it can double as a charcoal grill and just happens to be one of the least expensive of this type of smokers. This is a simple vertical smoker. You can’t go wrong with that. Its best feature is that it allows you to set it up depending on the amount of food you’ll be smoking so you don’t waste any charcoal. The Napoleon Apollo 3-in-1 smoker took the simple, vertical water smoker and elevated it to a whole new realm. It’s also known as the ProQ and is a three section smoker than can also be reduced to a pretty simple charcoal grill or have some fun and assemble it into a large capacity charcoal smoker. It’s loaded with great features, since this unit can smoke up large amounts of food or small quantities without wasting additional charcoal. It also has a standard design that features a bar in the lid so you can hang racks of ribs or sausages, a good airflow system and eyelets for meat probes. It might leak some smoke but that is a typical thing with this kind of smoker. Before we dive into the best BBQ Smokers you can get, we need to discuss the things you should be on the lookout for. This will help you assess which one’s the best for you and what makes each one a great choice for each particular situation. As with most other items, smokers can vary in cost from as little as $50 to up to $10,000 or even more. If you’re just getting started or won’t be using it as much, it’s better to start by using a small vertical smoker fueled by water, since they’re the least expensive. Electric smokers are extremely easy to use which makes them convenient. However, most of them fail to convey that authentic smoky flavor. Their main advantage is that the computer-controlled electric ones let you set it and forget, so the smoker stops as soon as your food is ready. No worries with it. Charcoal and wood smokers are the traditional ones and tend to give you that authentic smoky flavor when cooking. Some of the cheapest smokers use charcoal, but the most expensive ones tend to do so as well. Pellet BBQ smokers give you the best of both worlds since they’re powered by electricity that lets them provide heat and smoke but the pellets give it that authentic smoky flavor. Lastly, propane smokers tend to heat up faster and much easier than electric smokers while still being easy to use. What you get out of your BBQ smoker and the price range needed to cover it aren’t necessarily related, so you can get a great smoker with little expenditure and effort. The most important thing to consider in this sense is whether you want to be very involved in the process or not. Barbecuing and especially smoking are considered noble traditions where people sit by the fire and wait while they make great meals. Do you want to follow that tradition and be an active part of the process or do you want to just set everything and forget about it until it’s done? If you choose the latter, make sure you get electronic ones with computer control features so they automate part of the process for you. To select which smoker size would work best for you, you need to consider who you’ll be smoking meats and other foods for. The smaller units can smoke enough food for up to twenty people while the larger ones can make enough food to keep a party going all night. So if you only plan to smoke foods for your family on weekends and leisure days, a smaller smoker should be more than enough. If, on the other hand, you want to smoke for a large gathering, then you’ll need much more space. The good thing is that most BBQ smokers will show how much food can be prepared. Many units out there can not only smoke but also grill, so if you want to be able to do both, these are the ones to look out for. The most common ones to offer this versatility are the charcoal units. However, many other units at lower prices might also offer this feature, just remember that this will require a fantastic design, so not every unit that promises it, can deliver. Last but not least, remember that you might recognize the brand names but that doesn’t mean they’re the one for you. When looking into BBQ smokers, do some research on the companies that produce them. Generic smokers tend to offer no future support nor service so you’ll end up stuck with a useless unit if it ends up failing. When you find one that catches your eye, make sure you browse the internet for reviews from both users and experts to get the best choice available. In general, when people think of BBQ smokers they picture an offset smoker. These smokers have two chambers separated by either a sliding door or a vent. The main chamber is where you would place the meats and other food you want to smoke. Offset smokers can also be used just like a regular charcoal grill when you just don’t feel like smoking up some food. So to start smoking meats you’ll have to soak up the wood and charcoal, and place them in the offset chamber, close the lid and finally open the vent or door. You can use the vent to control the amount of smoke on the main chamber, simply open or close it in order to decrease or increase it. There is also no heat in the main chamber which means you can place your water pan anywhere you want. Offset smokers have a great advantage among all of the other types of smokers out there. Even though they can all help you create delicious meals, offset smokers feature different chambers for the smoke and the food. This means that it’s pretty easy to add more wood or briquettes as needed, without having to open the main chamber where your meat is smoking. Thus, you don’t need to worry about letting heat or humidity escape the chamber when it’s time to add more fuel. Additionally, you’re able to control the temperature much more effectively using an offset smoker than a regular charcoal smoker. Consider your options since you can get a trailer, racks for smoking jerky, front or bottom shelves, removable charcoal racks or drawers, extra grill grates or a counterweight on the lid. Check how well it’s made. Especially the welds, which need to be well executed and strong. It must also have insulated handles for your safety so you don’t get burned using the smoker. Adding to the previous one, we have build quality. The BBQ smoker should be made from heavy gauge steel and have a wheeled base that looks and feels substantial and stable. Make sure the lids on the main chamber seal properly. Also check the seal between both chambers to make sure it’s tight. Finally, check the warranty to make sure it matches the price. For example, stay away from $1000 offset smokers that only have a 1 year warranty. If you prefer traditional equipment, you’ll lean towards this type of smoker as the best one out there. However, being the first type of wood smokers to come out doesn’t necessarily make them the best. Otherwise we’d still be using the first PCs that spread across an entire room and are much less powerful than modern cell phones. If you’re looking for that nice smoky flavor, then it’s clear that your best choice is an all wood smoker. Thus, instead of relying on charcoal, you’ll be using wood to create the smoke, while still using heat. 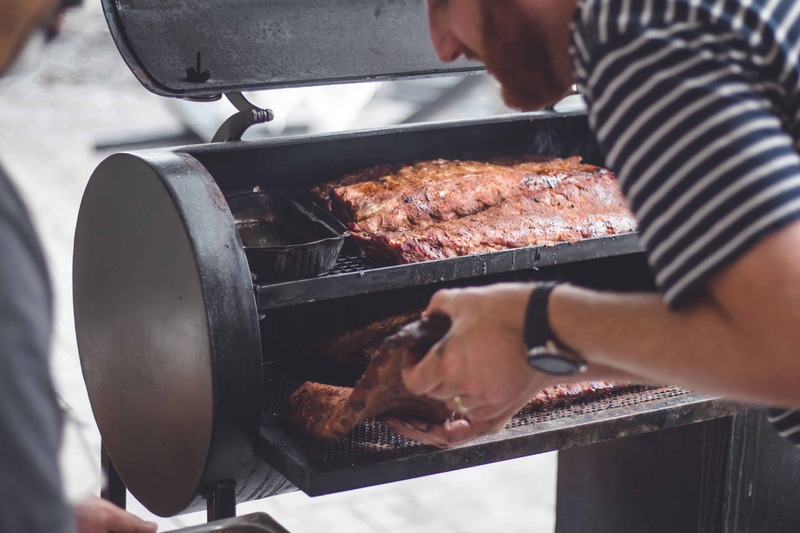 It’s also important to consider that it takes a bit more practice to truly master and get the results you want, using this type of smoker, but once you get the hang of it, you’ll never want to go back. However, it’s also important to be careful not to oversmoke the meats and that the wood you’re using burns clean for best results. For an added bonus, we recommend these wood pellets which are guaranteed to make your BBQ smoking experience much easier. Start by thinking about the kind of foods that you want to cook in it, For example, garlic bread, fish fillets, chicken breasts, vegetables, steaks and chops will only need a grill grate and a strong heat source. On the other hand, if you want to smoke dense vegetables, beef tenderloin, loin roast, whole chickens, prime ribs and more, you will need a smoker that has a high lid and offers simple temperature control, with lots of space. Consider which options you need. These might include insulated covers so you can also grill in cold weather, custom work tables, side tables, warming grates, thermometers, IR burners, and more. Think about portability if you want to take it with you on your vacations or trips. Same principle applies for your backyard of patio size, make sure you get a grill that accommodates in this sense. Finally, always make it’s made from heavy gauge steel, so you can be at ease and know that it will last you for many years. Even though charcoal smokers are very affordable and also provide great flavor to your food, they are still not superior to all wood smokers. When it comes to charcoal smokers, you’ll have to monitor the temperature carefully and add more charcoal, but you might also have to make adjustments to make sure the temperature is kept stable. A good way to accomplish is to follow the method we’re about to share. To use the Minion Method, you have to light a certain quantity of charcoal in the chimney, but keep in mind that this will depend on multiple factors, like wind speed, precipitation and the outside temperature. If it’s a sunny day outside, you can use twenty charcoal briquettes. On the other hand, if it’s windy or cool, between twenty to forty should be enough. If it’s a cold or rainy day, then it should be between forty to sixty briquettes. As soon as it’s possible to take the charcoal out of the chimney, place it on the unlit charcoal and make sure the pan has enough water so you can finally place your meats there. And to control the temperature, remember to configure the vents as needed. By doing this, you can produce burn times of up to eighteen hours with little to no interaction from you at all. Generally, this method is fantastic for when you need to cook for more than 6 hours and the best part is that it doesn’t affect the flavor or smokiness of the meat. Make sure you get a smoker with a good temperature control system. This will depend on your experience, the thermometers in the unit, the possibility to adjust the distance between the coals and the food, the lid and the dampers. Get a smoker with a tight-fitting lid and with a minimum of 2 dampers on it, including an intake and an exhaust. Your smoker needs to include a digital thermometer since the food’s internal temperature is extremely important to the final product’s taste. Even if they seem a bit pricey, they’re a great return on investment. Make sure you’re able to use two-zone cooking. These BBQ smokers tend to be very easy to use and offer great portability, but you’ll have to keep your eyes on it so you don’t run out of gas before your food is done. What actually makes them special is that it’s extremely easy to set the right temperature and keep it consistent, so you can set it and forget it until everything is done. It also lets you add wood chips for that smokey flavor and you can easily add more throughout the smoking process. If you simply want to cook burgers and hot dogs, you’re good to go. However, if you want to roast or smoke something like a whole chicken then you’ll need a rotisserie attachment. Make sure you check the grill’s BTU since it can tell you how much gas the unit will use and how much heat it can produce. Just remember that a higher BTY doesn’t necessarily mean faster or better cooking. Get a stable grill. Test it by pushing it from various angles and observe if it tips around or not. Also, check the shelves, firebox and lid for sharp edges. Finally, try to grip the handle and make sure your hand won’t end up close to the lid so you don’t get burned. Just like its name implies, electric BBQ smokers rely on electricity in order to smoke, so you won’t need to worry about any additional fuel source. This means that you can use it anywhere you have access to an electric outlet. You’ll just need wood chunks or chips placed near the heating area in order to create smoke. And depending on the model, it might feature exact temperature controls. However, it’s not a deal breaker if it doesn’t have one since you’ll still need to get your own high quality thermometer. Their best attribute is that you can never mess up, but their downside is that the smoked foods won’t taste as good as the traditionally-smoked ones. Make sure you get a grill with thick seals, metal and insulation since it will distribute the heat evenly around the cooking chamber and radiate it back. Always choose steel smokers. Get a BBQ smoker that has rust-proof and waterproof paint and that has large hinges and latches. If you want to caramelize sauces, can the smoker get to 500° F in order to caramelize or sizzle them? Make sure it has a damper on the chimney and another one on the firebox. This creates a tight seal that is easy to operate and reach. It’s always useful to get a model that features a built-in table, which can come in handy when you need to put sauces, cutting boards and other tools on them. Do your research on the smoker’s seller and dig into their warranty. Make sure it’s both pet and child safe if you have any. Remember that this is plugged into an outlet so there’s an additional risk. Consider the space you’ll have available to place it since you need enough space around it to avoid possible fires.